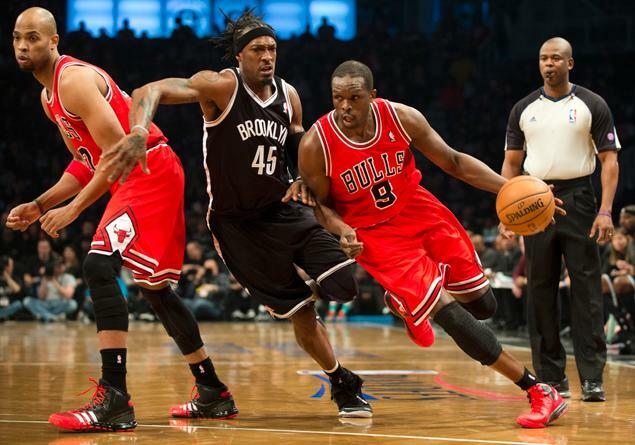 Luol Deng drives past Gerald Wallace Saturday in Game 1 of the Bulls/Nets series in Brooklyn, NY. Ed. note – Brandon Robinson – a young, but veteran, journalist based out of NYC, offers the view of a long-time observer of the Nets and of NBA basketball in general. Catch him on here on WARR online and on Regal programming throughout the Bulls/Nets series. The Brooklyn Nets and Chicago Bulls will duel it out in Game 2 of their first round playoff series tonight in Brooklyn after Chicago was manhandled by the Nets 106-89 Saturday night. “It was disappointing,” said Bulls big man Joakim Noah after Game 1. “We didn’t play well. We didn’t come out with the right mindset,” Noah added. The Nets benefited from strong play from center Brook Lopez who had 28 points and five rebounds on 10 of 19 shooting. Deron Williams had a stellar game for the Nets, putting up 30 points and 10 assists. 1. SHOOT Better — Carlos Boozer had 25 points and eight rebounds for Chicago but he can’t do it by himself. Chicago missed 17 of their first 24 shots. That’s unacceptable! In order to win, they’ve got to either set design spot up shots for Captain Kirk, or get Nate Robinson to knife to the basket. 2. Stop Williams and Brook Lopez (not one or the other) — Chicago was ill-equipped to stop either of those all-stars Saturday. That’s a problem that can not persist. 3. Get Noah going or get Noah some help — Brooklyn isn’t exactly known as an up-tempo team in the league, having been ranked the third-slowest paced team in the NBA this season. Ironically, the league’s third slowest team exploited Noah’s plantar fasciitis early on- feeding the ball to Lopez. who Noah was no match for. With that said, the Bulls need a plan of action either to sit him or aid him in a double-team core or they are in TROUBLE BUDDY! Brandon Robinson began his journalism career at 12 years old with the NBA’s Nets Basketball, hosting the kids radio show, Nets Slammin’ Planet on New York radio with Nets legend Albert King and Lynn Wilson. His show was featured on NBA Inside Stuff with Ahmad Rashad, Hoop Magazine, MSG Network and Fox Sports Network. He has interviewed everyone from U.S. governors, athletes and television personalities, earning the nickname “Scoop B.” He covered the Nets inaugural season in Brooklyn for BrooklynFans.com. Follow him on Twitter @ScoopB.